Happy New Near! Like you, we were greatly relieved to see a peaceful transition into the new century. Remember how distant the year 2000 seemed when we were kids? Once again, we renew our pledge to provide our far-flung village listeners the highest quality programming possible, filled with inspiration and encouragement. Our mission operates day to day thanks to your gifts and your prayers on our behalf. Thank you for continuing to make our important work possible. May Our Lord shower you and those you love with blessings this year, and always. SMILES (left): KNOM spiritual director Fr. Mark Hoelsken, SJ visits with volunteer Matt Christy in Studio B.
KNOM�s morning announcer and director of production, Matt organizes all of the station�s educational spots. Father Mark spends almost all of his time serving as pastor to the isolated villages of Chefornak (cheh-FOR-nuk) and Newtok (NEW-tahk), over 250 miles south of Nome, but manages to visit the station a few times a year to meet with staff and conduct retreats for the volunteers. INSPIRATIONAL SPOT: An apology is a great way to have the last word! top POPE RESCHEDULES SLED DOG RACE: We were planning to skip a 3-mile New Year�s Eve sled dog race, in order to broadcast Pope John Paul II�s millennial address at midnight, January 1st, Rome time (2PM in Nome). So the mushers delayed the �Y-2-Canine� race until the pope was finished! We also brought our listeners Nome�s (frozen) �Turkey Bowling� event on the ocean ice, live coverage of western Alaska�s most spectacular fireworks ever, and with the temperature a frigid -27°, a midnight Eskimo-style blanket toss, in which Nome resident �Boogles� Johnson was catapulted upward in the old year and came down in the new. THANK YOU to everyone who contributed toward our new emergency generator! 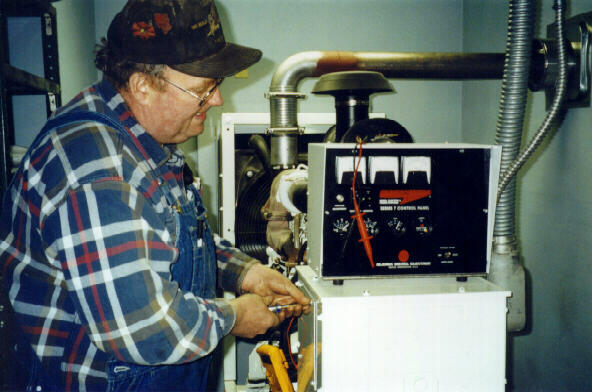 (Left) Machine shop owner (and Nome volunteer fire chief) Doug Doyle opens the generator�s control panel, just ahead of adjusting the machine�s output voltage and frequency. JUBILEE INSPIRATIONAL SPOT: Life can be understood when you look back. But life must be lived forward. top A BATTERY OF PROBLEMS: While we were testing the new generator in mid-December, we discovered that nearly every emergency battery in our studio had failed due to age. These batteries protect sensitive equipment from power glitches, and keep them running during outages, in the few seconds it takes the generators to come up to speed. Five of our Uninterruptible Power Supplies (UPS�s) were so old that new batteries were not available, and we traded the old units in for a discount on new ones. In addition, we purchased 7 batteries for our newer UPS�s. The unexpected, but necessary expense of doing this was $2,142.89. Can you help? THE POWERFUL 25,000 Watt KNOM signal beams strong throughout western Alaska at 780 on the AM dial, beaming God�s Love throughout dozens of isolated Eskimo, Aleut and Athapascan Indian villages, and far into Russia as well. 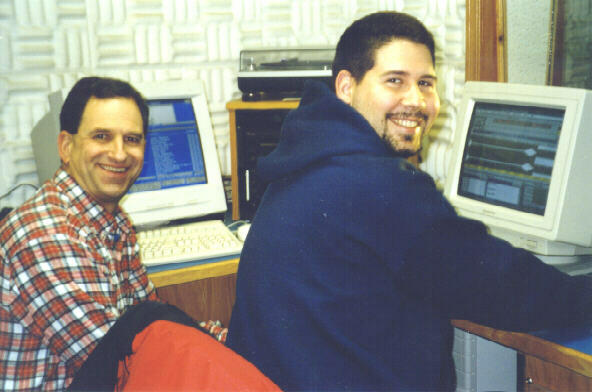 Founded in 1971, we are the oldest Catholic radio station in the United States. Our mission serves this vast, impoverished region with inspirational and educational programming, news, information and positive entertainment 24 hours a day, thanks to you. top FROZEN SOLID: The ice in the Bering Strait set up early this year, allowing villagers on the remote island of Little Diomede (DYE-uh-meed) to scrape a smooth runway on the sea ice. Nome pilot Donny Olson landed the first plane on the ice December 28, 1999. Usually, the ocean ice isn�t safe until February, but thanks to a deep cold spell, it was freezing at a rate of an inch a day. With a population of 136 Inupiat Eskimos, the rugged village sits only three miles from Russia�s Big Diomede Island, with the International Date Line in between. According to Olson, the ice runway is barely on the American side of the dateline. THEIRS FOR THE OXEN: In December, a herd of thirty musk ox decided to camp on the village of Deering�s runway. The huge animals trampled orange marker cones and broke runway lights. Musk ox, which can weigh up to 650 pounds, don�t easily yield the right-of-way, and the beasts held their ground for several days. About 140 miles northwest of Nome, Deering was founded as a gold mining supply station in 1901. Today, its 148 residents are mostly Inupiat Eskimos who primarily live off the land. Forgiveness ought to be like a canceled note, torn in two and burned up, so that it never can be shown against one. top MARATHON (left): KNOM general manager Tom Busch anchored a 7-hour Christmas greeting program December 21st. Tom put 305 callers on the air, from Nome and 28 villages. 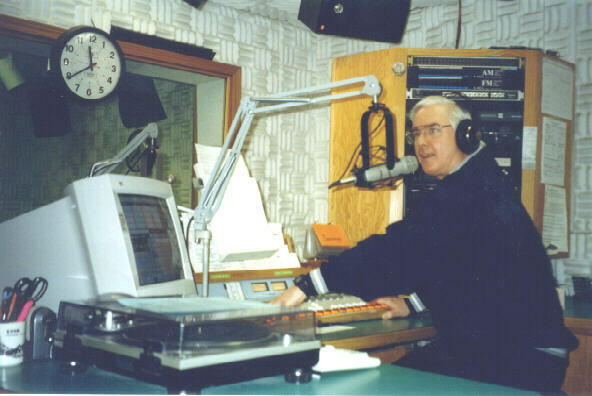 Program director Ric Schmidt estimates that on that day, our callers extended holiday greetings to over 4,000 people! Please consider adding missions like KNOM to your will. God bless you! ALASKAN-SIZED LISTENING AREA: In December, volunteer Michael Warren produced an interview with Nome professor Anne Millbrooke, on the topic of educational opportunities for young adults. A few minutes later, Anne received a call from Barter Island. That�s on the Arctic Ocean 720 miles northeast of Nome, next to the Canadian border! The following week, our Christmas call-in drew calls from listeners on St. George Island, 560 miles south of here. How wide is KNOM's listening area? At least 1,300 miles, by that reckoning. That's the distance between Toronto and Miami Beach! 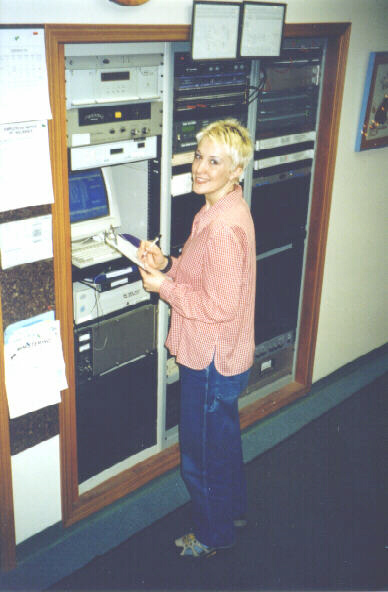 READING MATERIAL (left): KNOM volunteer music director Kelly Brabec jots down transmitter readings from equipment in the rear of our studio building. Via microwave relay, a studio computer keeps track of our transmitter�s power level, voltages and currents, the status of our tower lights, as well as the temperature inside the remote transmitter building, three miles east of Nome. In addition to automated control, we take periodic manual readings. This keeps everyone on the staff alert to changes in the readings that are too small to trigger alarms but which merit a checkup by Les Brown or Tom Busch. CHRISTMAS HAM: Congratulations to Nic Schmidt, Ric and Lynette�s 11-year-old, who passed his ham radio Technician test in December and is now KL0VJ. Yay, Nick! IN THE MAIL: In the third week of January, we will mail a receipt to everyone who contributed more than $250 during 1999. If your gifts were below this amount and you�d like a receipt, please write and we will be happy to send you one. GLOBAL WARMING? December 1999 was Nome�s coldest December on record, says the National Weather Service. While the air never dropped below -29° F., it remained consistently cold. The month�s average temperature was �9.4°. Brrr! THANK YOU AGAIN. Our mission has been honored by many awards, but the greatest tributes to our work are the loyalty of our village audience and your friendship and support. God bless you!